Wash and slice the eggplant, thick slices, put some salt on each slide and let it sit for a couple of hours, this way you get rid of some water. There are several ways to make this recipe, I think the original one implies to fry the eggplant, but I’m not gonna do that, I do care about my health! LOL Instead of frying I’m gonna wash and dry with a paper towel the eggplant and then I’m gonna dice them and pass them into a pan, with nothing else, I just one to let them dry a little and “seal” them. Then take them out and use another pan, or the same one, chop the onion and brown it in some olive oil. When the onion is ready, add the diced tomatoes, some salt and the hot pepper, let it cook for 10 min with medium heat, stirring occasionally. Then add the eggplant to the sauce and let it cook for another 10 min with the lid on. In the meanwhile boil some water in a pot, add salt and cook the rigatoni. When the rigatoni are “al dente”, add the pasta to the sauce, mix and add some basil. 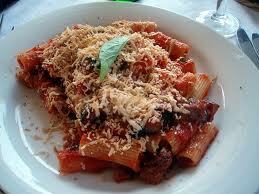 the dish is ready to be served, grate some parmigiano or for a better taste some pecorino romano. This entry was posted	on Wednesday, November 11th, 2009 at 6:29 am	and is filed under Cooking Time, English Version. You can follow any responses to this entry through the RSS 2.0 feed. You can leave a response, or trackback from your own site.